Fadil (second right) holding one of the work cards. 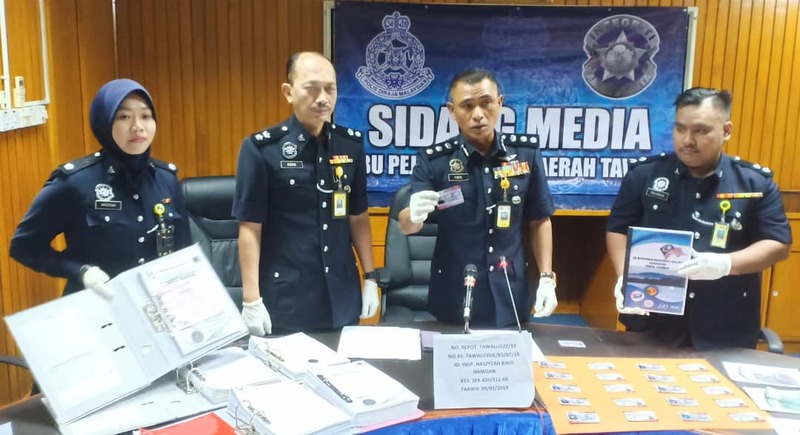 TAWAU: The Police Commercial Criminal Investigations team has successfully crippled a syndicate providing work cards for foreigners and individuals without identification with the arrest of nine individuals. District police chief ACP Fadil Marsus said four men and five women aged 20 to 65 years-old were detained and remanded for four days for investigation under Section 420/511 of the Penal Code for attempted cheating. In a press conference today, he said the suspects were detained on Wednesday at about 4pm at a 1st floor premise in Sabindo Square. Fadil said the company has been carrying out the activity to process and create a work cards for foreigners and individuals who have no identification in Sabah to get employment at any companies or factories operating in Sabah as substitute to the Immigration Department job permit. Each application requires a processing fee of RM800. He advised members of the public not to apply for such documents without verifying with departments or agencies concern.